During the last 5 years, DipTech a company located in Kfar Saba, Israel did succeed in combining the advantages of modern high-definition Digital Printing with the virtues of the Ceramic Silkscreen Printing. This combination has helped to establish hundreds of colorful architectural applications worldwide. Now it is possible to produce colorful fotorealistic ceramic images being burned in on glass in a high-temperature process under reasonable expenses. Those prints are really scratch-resistant, colorfast and weatherproof. 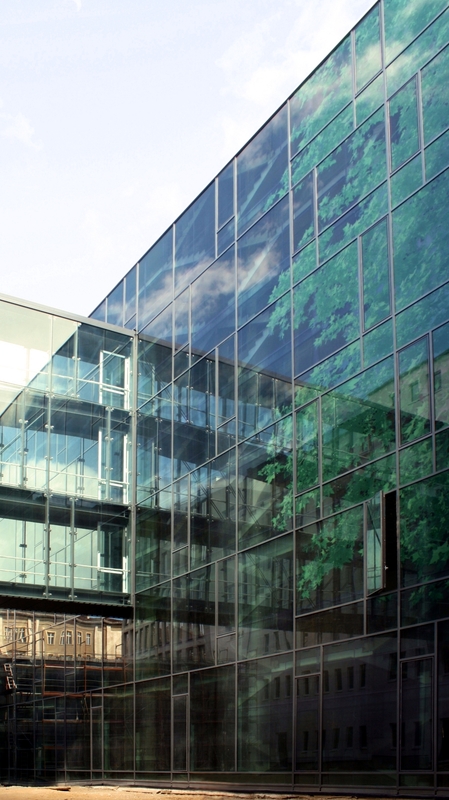 Due to it’s high resolution and reproducibility, new interesting effects and variations are possible and a feasible opportunity for the designing of façades with everlasting very high format color-printing on a low cost budget is given. Hoffmann GTD, a glass design engineering company, located in Hildesheim, Germany has taken the task to join its experiences with other creatives, for the inspiration and information of architects and designers, to pave the way for a quick and easy access into an encouraging new technology that may open new dimensions for creating modern architectural design. Hoffmann GTD is offering assistance to designers and architects as well as to producers of glass and glassdesign to optimize the visual performance of their artworks. Other techniques like PVB-interlayer-printing, foto- or effect-lamination, silkscreen printing, sandblasting and many others are taken into account as well.